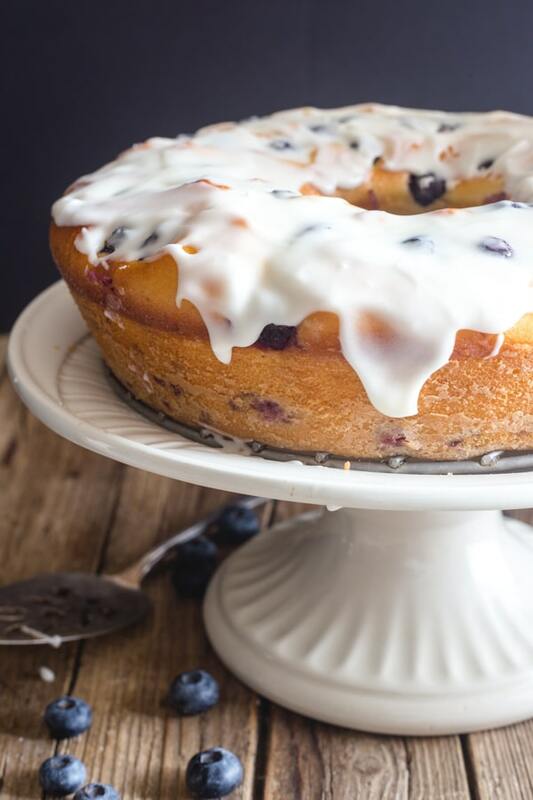 This Easy Blueberry Cake is made with yogurt and fresh blueberries. A simple moist cake delicious dusted with a little powdered sugar or drizzled with a vanilla glaze. Brunch or Dessert it’s perfect! With the Blueberry Season upon us it’s so easy to find Fresh Blueberries. This Blueberry Streusel Loaf is one of our favourites and perfect anytime of the day. After living in Italy for so long I have become accustomed to eating the occasional slice of cake even for breakfast, and yes this Blueberry Bundt Cake is perfect. Whether you add a dusting of powdered sugar or drizzle the Vanilla glaze it’s delicious either way. Since we are such big blueberry lovers we even went out and planted a few plants. I hope to have fresh berries next year. I usually toss the blueberries (fresh or frozen) with 1-2 teaspoons of flour. Of course some will sink but not all. So it does help. If you decide to use frozen blueberries, then be sure to thaw them in the refrigerator and drain any excess juice toss the berries with approximately 1 1/2 teaspoons of flour. In a medium bowl, beat eggs then add the oil, sugar, milk and yogurt, beat for 1 minute until smooth. 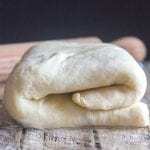 Add the flour, zest, baking powder and baking soda and beat until well combined. Pour into greased cake pan and bake 35-40 minutes or until tested done (when toothpick or knife inserted in cake comes out clean). Let the cake cool completely before dusting with powdered sugar or drizzling with the Vanilla Glaze. 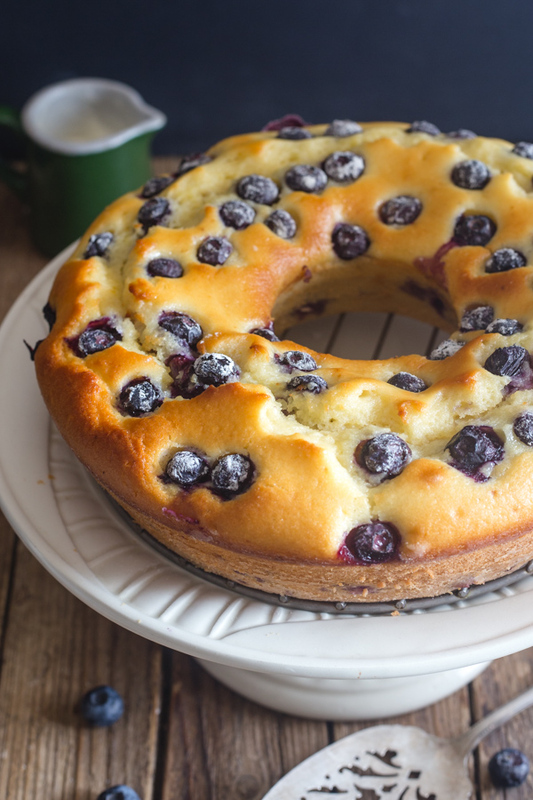 For this Blueberry Cake Recipe I used a 9 inch (23 cm) bundt / tube pan but you could also use an 8 inch cake pan if you wish. 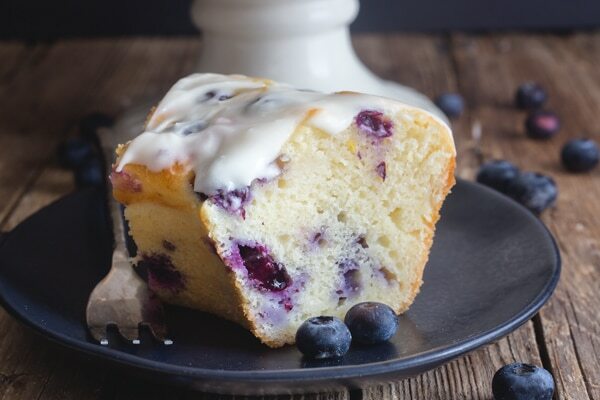 What is kind of yogurt can I use in this Blueberry Cake? I used Greek Yogurt for this cake with a couple of tablespoons of milk, although you can use regular yogurt just eliminate the milk. Since Greek yogurt is thicker than regular yogurt, the milk is needed to thin it out a bit. If the Blueberry Cake is dusted with powdered sugar then it can be left (covered) at room temperature for approximately 2-3 days. But if you decide to glaze it then it is probably best to cover the cake and refrigerate it. It should last up to 4-5 days. This Cake can also be frozen, be sure to wrap the cooled unglazed cake tightly with plastic wrap then wrap again with foil, place in an airtight container or freezer bag. It will last up to 3 months in the freezer. To thaw the Cake remove it from the container or freezer bag, but still wrapped and let it thaw at room temperature. Should take about 2-3 hours. 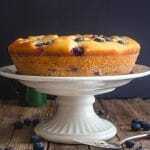 So if you are looking for a way to use up those fresh blueberries I hope you give this Blueberry Cake Recipe a try. Enjoy! 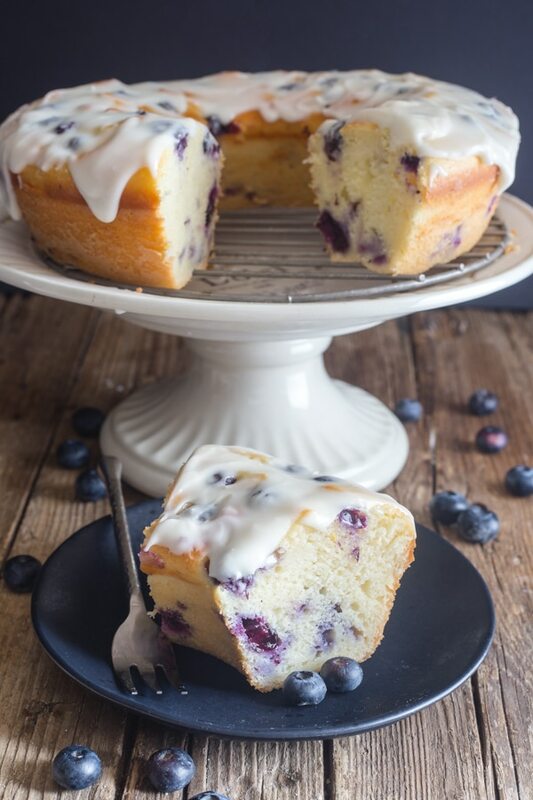 This Easy Blueberry Cake is made with yogurt & fresh blueberries. 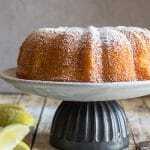 A simple moist cake delicious dusted with powdered sugar or drizzled with a vanilla glaze. *If you wish you can use regular plain yogurt just eliminate the milk. Heat oven to 350 degrees (180° celcius). Grease and flour an 8 inch (20 cm) cake pan or 9 inch (23 cm) bundt/tube pan. 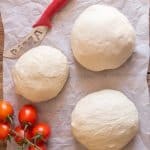 In a medium bowl, using a hand mixer on medium speed, lightly beat eggs (approximately 30 seconds) add oil, sugar, yogurt and milk, beat for 1 minute until smooth. Then add the flour, baking powder, baking soda and zest, beat until well combined, approximately another minute. Toss the blueberries with the teaspoon of flour and gently fold half of the berries into the batter. 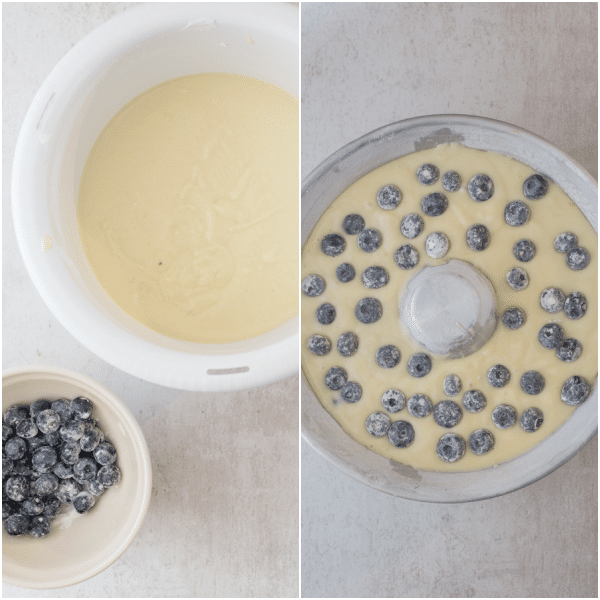 Pour the batter into the prepared cake pan, then top the batter with the remaining half of the blueberries, bake for approximately 35-40 minutes or until tested done (when toothpick or knife inserted in cake comes out clean). 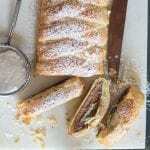 When cool, dust with powdered sugar or drizzle with Vanilla Glaze. Stir together the sifted powdered sugar, cream or milk and vanilla until smooth. Add more or less cream to reach desired thickness.